My mother is impossible to shop for. She always buys for herself whatever she needs; Christmas, birthdays, or Mother’s Day be damned. We poor gift-givers are usually stranded without a clue about what to give her. Desperate and at a total loss one Christmas, I wandered among fellow clueless shoppers on my quest for The Perfect Gift. Mom’s standard rule, issued years ago, still stood: No appliance or cleaning apparatus. And she already had a closetful of nearly new slippers and robes, and she didn’t wear much jewelry and had given up on collecting candles years ago. The options were few. As I gazed in panic at the shops around me, I had a flash of inspiration, like when one sees her life flash before her eyes prior to her demise. I remembered Mom’s story about a gift she received as a little girl. The eldest of six children in a poor coal mining town, she didn’t get many presents at Christmastime. The one gift she asked for year after year was a doll. After years of waiting, she finally got one, but her younger sister, the rotten one, tossed the doll into the abyss of their outhouse. My mother was devastated. Spurred on by this recollection, I made my way to a shop that specialized in collectible dolls. 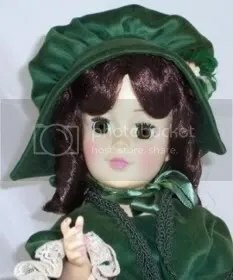 I found a lovely girl doll who stood almost a foot tall, with long brown curls (my mom, sister, and I all were brunettes) and big brown eyes. She was dressed in a rich forest green velvet coat and wore white stockings and brown leather shoes. Her tiny hands were tucked into a fur muff and she wore a matching fur hat. I wrapped her with care, choosing elegant paper, ribbon and bow. My sister, who was home for Christmas, knew about the doll and was nearly as excited as I was. We gathered in my parents’ family room on Christmas Eve to exchange gifts and I sat nervously waiting for Mom to open mine. She pulled the box onto her lap and gave it a playful shake, then carefully pulled off the bow and ribbon to be saved for next year. She unwrapped the box with a puzzled look, and then opened it. My sister and I both held our breath. “Oh. Oh my,” Mom crooned as she gently lifted the doll from the box. “How beautiful she is!” and the tears began streaming down her face. My sister and I shared a watery smile of gladness. I realized then that this was not just a gift for Mom, but for all of us. It was The Perfect Christmas gift. *The above story is original material protected by copyright, and appears here with the author’s express permission. Posted by V. T. Eric Layton on 14 December 2011 in Story Time and tagged Christmas, doll, Donna Hrkman, gift, mother, shopping, story, The Doll, the perfect gift. I enjoyed the story, too. Thanks for posting and for your warm Christmas wishes! Have a wonderful time, my friend! !